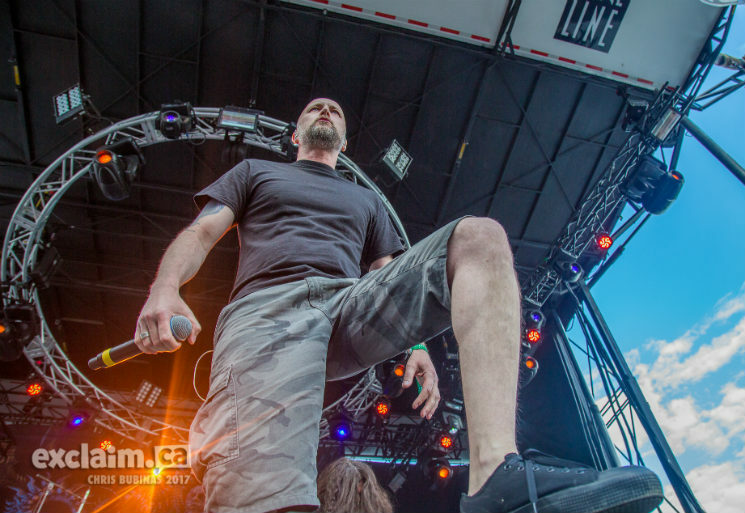 During their Saturday evening (June 24) set, Swedish progressive death metal act Meshuggah sounded polished and machine-like in their ability to churn out their extremely technical songs. The band's tribal-esque vibe suitably turned the savage crowd into a frantic, violent fight scene. Opening with "Clockworks" from their latest record, The Violent Sleep of Reason, the band were able to immediately get the crowd moving. Showing little emotion during their set, the band were well-composed, but could have benefited from a little more interaction with their fans. Despite this, people were glad to see their technical prowess in action. After a sun-filled afternoon that followed a wet and muddy first day of the festival, the rain made its ugly return, spurring vocalist Jens Kidman to jokingly tell the crowd he was glad he could command the weather. The tech giants then kicked off signature track "Bleed," putting security to work as crowd surfers were thrown on top of other crowd surfers while the band chugged out their deep, polyrhythmic sounds.